Get ready for something brand new like no other! 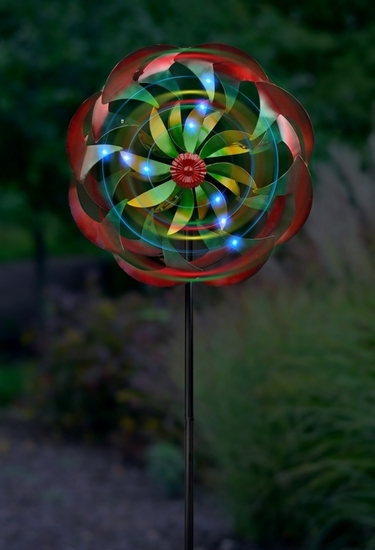 We are thrilled to release our exciting new Wind-Powered LED Light Flower Wind Spinner! That's right, not only does this tall 84" metal wind spinner look amazing, but it also has LED lights on it that are literally powered by the wind. The faster is spins, the brighter they light up! We love extra large wind spinners and we are thrilled to offer these exciting new impact designs! This handcrafted steel metal spinner has been reinforced with a high quality and durability design, with a beautiful metallic finish and powerful H-Stake for extra ground stability! Size: 84" Tall, 23" Spinner, all Metal. Super strong iron bearing casings. Lights up with wind power!